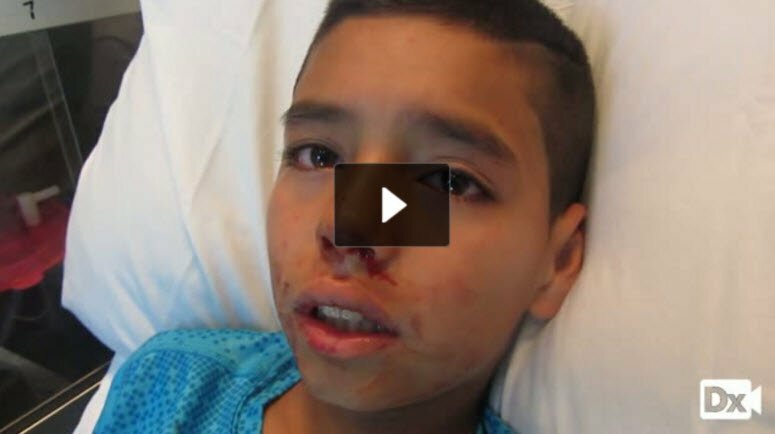 Patient will present as → a 14-year-old who is brought to your Emergency Department (ED) with an intractable nosebleed. Pinching of the nose has failed to stop the bleed. In the ED a topical vasoconstrictor is tried but also fails to stop the bleeding. 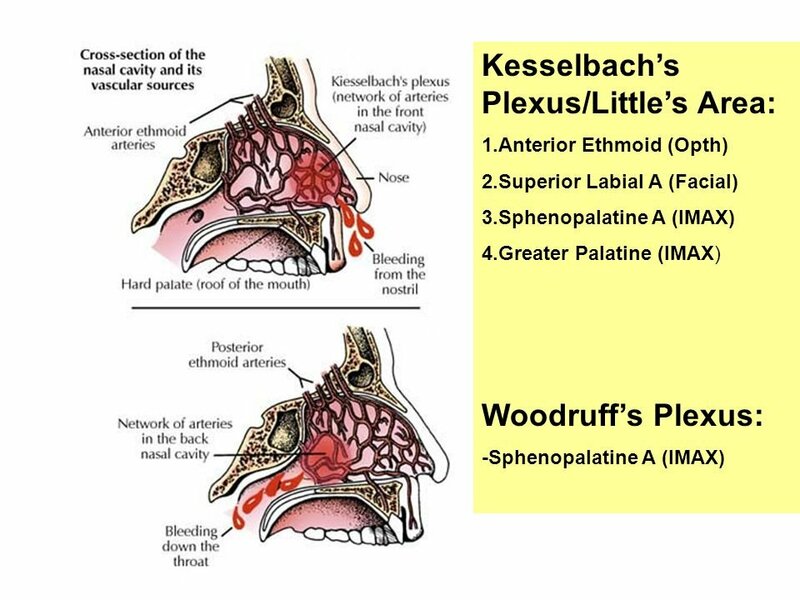 Woodruff's Plexus is the most common site for posterior nosebleeds. The sphenopalatine artery is generally the source of severe posterior nosebleeds causing bleeding from both nares and posterior pharynx. Patients should always be asked about aspirin or ibuprofen use. Patients with symptoms or signs of a bleeding disorder and those with severe or recurrent epistaxis should have CBC, PT, and PTT. CT may be done if a foreign body, a tumor, or sinusitis is suspected. Patients with nasal packing must be treated with antibiotics (cephalosporin) prevent toxic shock syndrome and patient has to return to take the packing out. Gelfoam packing, cauterization of Kiesselbach's plexus, and topical lidocaine and epinephrine are helpful in treating an anterior bleed, but not in a posterior bleed. A posterior balloon packing is used to treat posterior epistaxis. These patients must be admitted to the hospital and prompt consultation with an otolaryngologist is indicated. electrocautery of the bleeding site. Cautery is not used because the edges of the cauterized area may begin to bleed. Silver nitrate is not used in children because it increases the risk for nasal septal perforation. Posterior nasal packing is indicated for posterior bleeds in the inferior meatus. Petrolatum gauze will provide pressure to the bleeding point while the cause of bleeding is corrected. What is the most common location of anterior nasal epistaxis? The inferior turbinate is the most common location for posterior epistaxis. 90% of all cases of anterior epistaxis originate from Kiesselbach's triangle. An elderly patient with a history of hypertension presents with epistaxis. On examination you note blood from both nares and down the posterior oropharynx. Examination of the nasal cavity with an ENT headlamp does not show an area of bleeding. Which of the following is the treatment of choice in this patient? Cautery and direct pressure are effective in anterior, not posterior epistaxis. Petroleum jelly application is not indicated in posterior epistaxis. Posterior epistaxis is more common in elderly patients, especially with hypertension. Posterior nasal packing is the treatment of choice.